Serving a dual-purpose, Healing4Heroes assists veterans and military service members while also rescuing unwanted dogs from local shelters in Georgia. Disabled veterans or active duty military members who suffer from a physical disability, Post Traumatic Stress Disorder (PTSD), Traumatic Brain Injury (TBI), or other cognitive impairment are eligible to obtain a service dog, free of charge, providing they are able to care for the dog and meet eligibility requirements. Former Army Captain Piper Hill, founder of Healing4Heroes, suffered a Traumatic Brain Injury suffered while serving during Desert Storm and cannot remember many details of three years of her life. But she does remember that Valentine, her 80-pound American Bulldog, never left her side, and she credits her faithful canine companion with saving her life. This experience inspired Piper to dedicate herself to helping other wounded veterans. 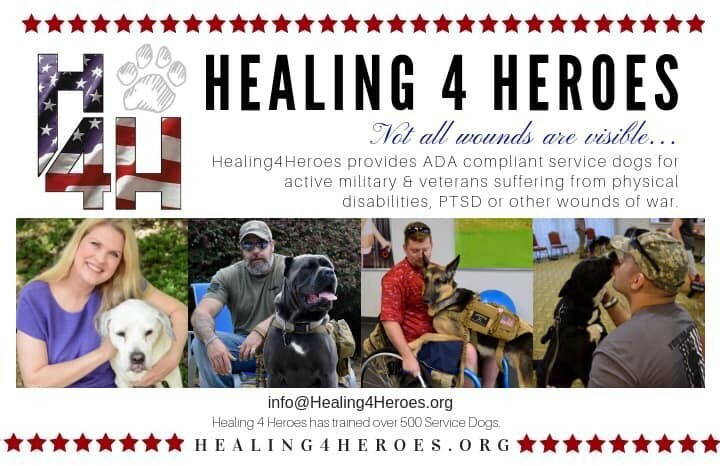 Healing4Heroes exists to help our nation’s heroes overcome the visible and invisible wounds of war while also training abandoned and neglected dogs as ADA compliant service dogs. The dogs help give service members the confidence and security to live fulfilling, productive lives. Previously unwanted dogs are given the opportunity to become a cherished member of thankful family. The needs of each service member vary, and service dogs can be trained to help their handlers with anxiety, depression, and anger as well as assisting with specific tasks. Service dogs can even be trained to wake people from bad dreams, a common symptom of PTSD. Each service member is directly involved in the individualized training of a specially selected service dog, cementing a one-of-a-kind bond that results in healing for the veteran and the dog. 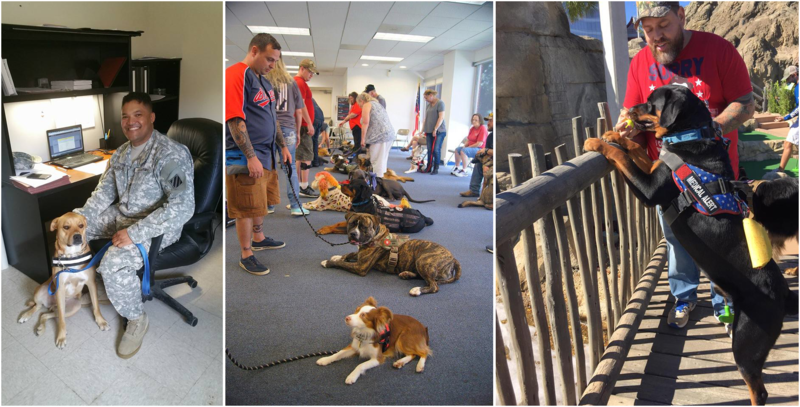 The cost caring for the dogs and providing training is approximately $7500 per dog, but Healing4Heroes provides their services at no charge to eligible service members. Relying on grants, fundraising, and donations, Healing4Heroes is an award-winning nonprofit, earning the GreatNonprofits distinguished Top-Rated Nonprofit Award three years in a row! 4Knines is proud to shine a light on the great work of Healing4Heroes. We hope you will join us in supporting this worthy nonprofit. Consider volunteering, shopping, or making a financial donation to help Healing4Heroes continue serving the military and canine community.